I can’t bear to think of the day when my sons will no longer treasure a really good bedtime story. I know that the day will come, when iPods and pimples and tossing notes in class will take precedence over a really great pre-sleep read, but for now, I will hold each moment and each book dear – especially Johanna Wright’s “The Secret Circus.” With just enough repetition to lull those little eyes to half-mast, and just enough intrigue to keep them open, this darling book tells the story of a Parisian circus that is so small, “only the mice know how to get there.” And those mice do go there, dressed in their top hats and parasols and other mouse finery. A wonderful, wonderful book for little ones with big imaginations. 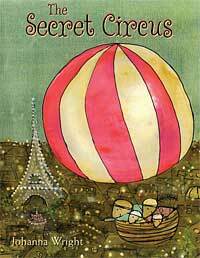 So, tuck them in tonight with “The Secret Circus” and enjoy that wonderful age and that wonderful book together.